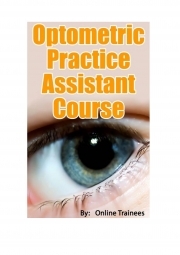 Description of "Optometrist Practice Assistant Course (eBook)"
Always remember that it is stressful to be in an unfamiliar environment - people are scared of the unknown, and YOU have to reassure them and make them feel comfortable. They should view their eye care professional as a personal friend. Turn the appointment into a pleasant and fun experience. People enjoy going back to their favourite haunts with family and friends – make the visit to the optometrist one of these. Online Trainees produce manuals and courses on various subjects. Reviews of "Optometrist Practice Assistant Course (eBook)"